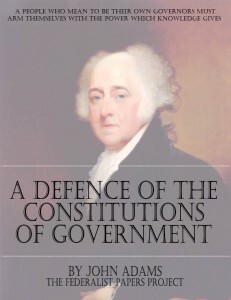 John Adams wrote and published “A Defence of the Constitutions of Government of the United States of America” in three volumes. The American edition was published the same year in New York and Philadelphia. The work occurs in the middle of his career and reflects the depth of thought that our founders engaged in while building a new country. A Defence of the Constitutions of Government was stimulated by the writings of Anne Robert Jacques Turgot, the Abbé De Mably, and Dr. Richard Price. The books are organized in letters so that Adams could address diverse topics and historical periods while relating them to the argument before him. In the first letter, dated October 4, 1786, Adams reviewed the critiques of Turgot in particular and proposes to address the issues and criticism. He wrote to defend the various Constitutions which had been enacted within the States at that time, while examining the processes used to balance power and avoid tyranny.